Medium format sensor cleaning swab. 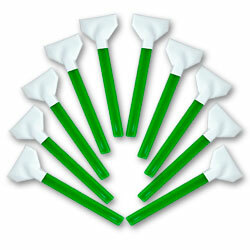 Digital back sensor cleaning swab. These medium format sensor cleaning swabs are suitable for cleaning sensor of a Digital Back CCD or medium format SLR cameras such as Pentax 645 and Pentax 645Z, Pentax 645D, Fujifilm GFX 50S, Hasselblad X1D. VisibleDust has designed the new Digital Back Sensor Cleaning Swabs by utilizing the same technology used to fabricate our regular MXD-100 Green sensor cleaning swabs. These swabs are custom designed to fit the large sensor of the Digital Back CCD cameras and medium format digital SLR cameras such as Pentax 645 and 645 Z, Pentax 645D, Fujifilm GFX 50S, Hasselblad X1D. Patented. Pentax 645 and Pentax 645Z, Pentax 645D, Fujifilm GFX 50S, Hasselblad X1D.